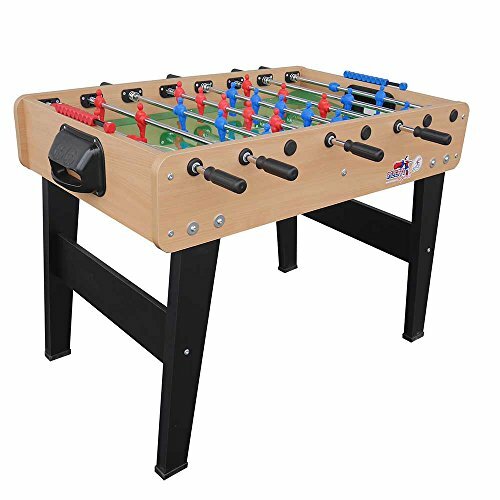 Free play soccer table with standard dimensions. Ideal for home use, bringing joy and thrilling moments to all family members! Laminated body with ABS edges. 16 mm drawn steel rods treated with anti-rust chromium. Telescopic rods (which do not come out of the table) make game play safe for players of all heights. 5 mm tempered unbreakable glass playfield. Plastic bushings for reduced friction and wear. Beech wood legs, strengthened with a crossbar, Ball recovery slits placed on both playfield sides, Available in white body case with red legs, beech body with beech legs, or black body with silver legs. International Trim: Rounded Player feet and sandblasted playfield glass. 2 year, bumper to bumper warranty. If you have any questions about this product by Roberto Sport, contact us by completing and submitting the form below. If you are looking for a specif part number, please include it with your message.